This post was originally published on Hello Jackson on February 10, 2014. One of the most exciting things for any high school girl is going to shop for a prom dress. This excitement comes back and multiplies when it’s time to find the perfect wedding gown. Rina’s Bridal & Quinceañera Boutique is a great place to shop for those very special dresses and accessories. Rina’s specializes in bridal, bridesmaid, prom, pageant, quinceañera, and baptism dresses. Most of Rina’s clients come for designer bridal gowns and bridesmaids dresses, not only because of the gorgeous pieces in stock but also the in-house alteration service. 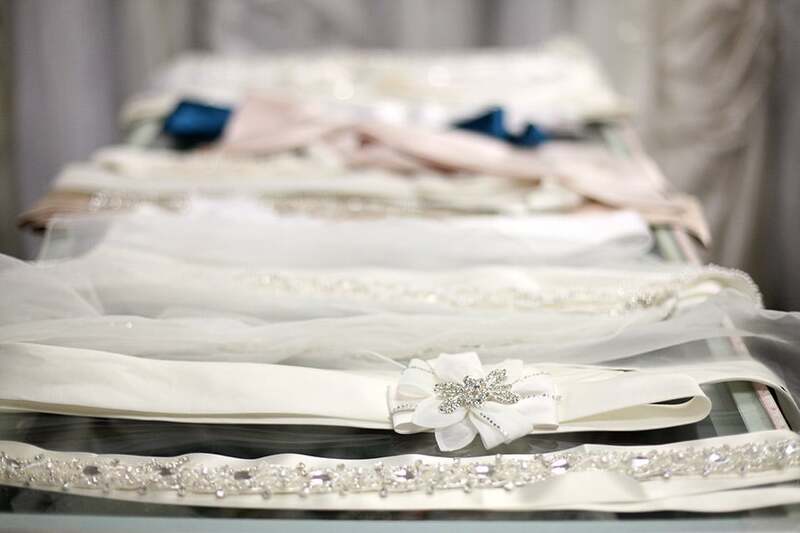 Custom made veils and sashes also make Rina’s a great place to shop for a complete bridal look. The bridal collection is very budget friendly, ranging from $70 to $2000. Quinceañera dresses and accessories are also very popular, and many clients travel from other cities to shop Rina’s selection. I first found out about Rina’s at the 2014 Bridal Show, but they have actually been in business since 2011. They quickly moved up from their smaller location on North Parkway. “We were blessed in 2012 to have the opportunity to purchase our plaza on Highland, which we named Mustard Seed because we believe it’s the start of something great,” Rina Cerdeira, owner, said of their move. Mustard Seed Plaza is an adorable little strip of shops located right on Highland, and Rina’s occupies the two left spaces. With the move to a bigger space, they were able to expand the designer gown offerings significantly and provide a completely separate area for bridal. Rina has always loved fashion and art. After going to school for graphic design, she wanted a creative outlet that incorporated both of her passions, and the boutique was a perfect fit. She runs her business with Christian values and promises to treat everyone who visits her store in the same way that she would want to be treated. “I love that we are in an industry that makes people happy. It’s not easy, and we have spent many late nights in the sewing room, but it’s worth it when our customers put on their dress and look amazing,” she says. As a wedding photographer, I can absolutely relate to that. It is truly heartwarming to see a bride’s face when she sees herself in that perfect dress. Rina’s Bridal & Quinceañera Boutique is located at 2665 North Highland Avenue, and hours are Tuesday through Friday 10:00 a.m. to 6:00 p.m., Saturday 9:00 a.m. to 5:00 p.m.. Visit their website, Facebook page, and Instagram for updates.